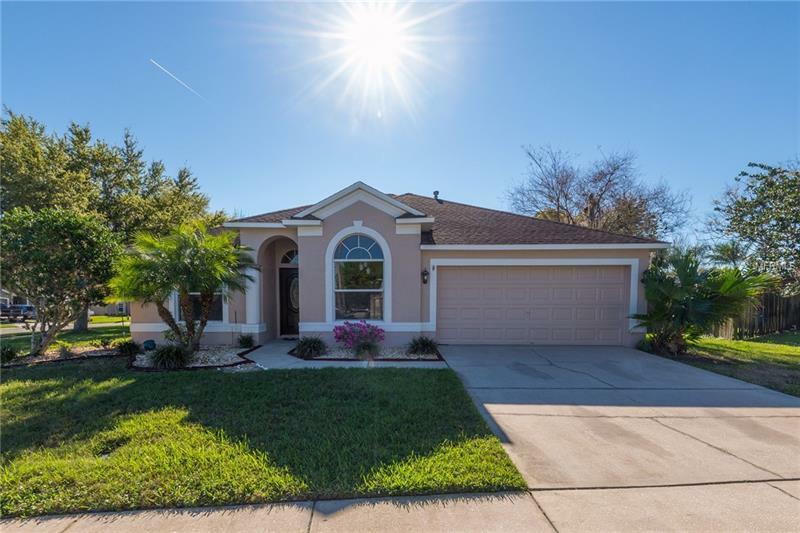 You don’t want to miss this Fantastic home in the heart of Wesley Chapel located in in the desirable community of Meadow Pointe. This home sits on a HUGE (just under 1/3rd acre) corner lot & features 4 bedrooms 2 baths 3-way split floor plan just under 1600 sq ft a NEW ROOF in 2015 BRAND NEW AC & GAS HEAT UNIT 1 year old water heater all new interior & exterior paint & IS PRICED TO SELL. Upon driving up you will notice the tropical landscaping that leads you to the beautiful front door with glass insert. The interior boasts vaulted ceilings laminate floors in all main living areas & bedrooms & tile in the wet areas & formal dining room. The kitchen has ample counter-tops & cabinets for storage w/a closet pantry. The master bedroom is nicely sized w/a large walk-in closet and & master bath features a glassed walk-in shower & large garden tub. The other guest bedrooms share a bathroom with a tub/shower. You’re going to love the HUGE COVERED PORCH w/2 ceilings fans to cool you off during those hot summer days! Perfect for entertaining or just enjoying the day pass you by. Close to all shopping restaurants and the hospital in Wesley Chapel. The new ice skating facility is within an easy drive from this home. Wesley Chapel is a fast growing area with all of the amenities that you can ask for. The Pasco-Hernando State College is at the edge of Meadow Pointe. There are two and soon to be three elementary schools John Long Middle and Wiregrass High located within Meadow Pointe all highly rated.